Most people are struggeling to find good way to develop their comping, and especially coming up with good rhythms to support a soloist in an interesting and varied way. In this lesson I am going to take a simple rhythm that everybody needs to know anyway, and I am going to show you how to develop that into more interesting rhythms. If you play in any kind of ensemble you are probably spending more time comping than soloing, but at the same time it is ironically also a skill that most people doesn’t work too much on. This is ironic both from the point of view that we spent the most time doing this and also that if you can comp well you are asked to play much more often. 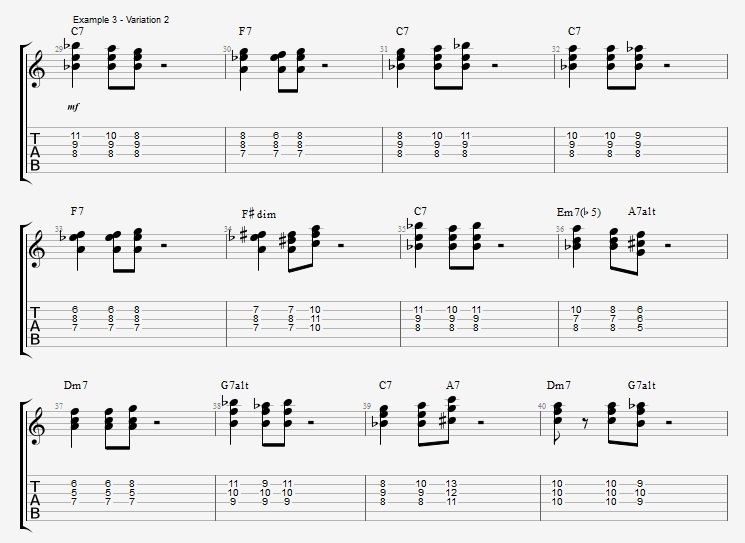 The Rhythm that I am using as a starting point in this lesson is the Charleston Rhythm. This is a good first choice to start with since it has two notes one on the beat and one off the beat, so you have a sense of the swing feel even with just these two notes.. The way I approach making variations with the Charleston rhythm you can actually do with any rhythm that you come across. Since I am concerned with rhythm in this lesson and not the voicings I’ll leave the discussion of the voicings out. I have a lot of lessons on melodic aspects of playing voicings and on different times of voicings you can check out. 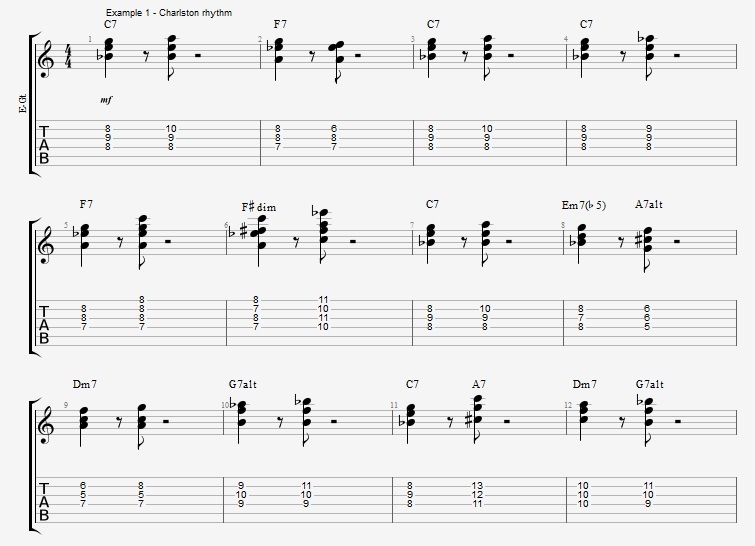 The first example is the basic Charleston Rhythm through a 12 bar blues in C.
Once you can take this rhythm through the progression yourself (using your own voicings and with some freedom in making your own melodies) Then you can start working on the first variation. Basically what is happening is that I am starting with two 8th notes instead of a quarter note, and then I took that through the Blues progression. 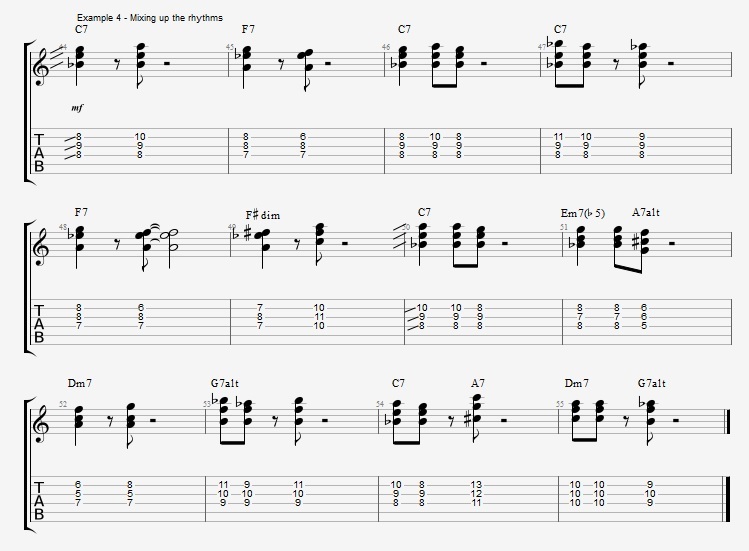 When you can do this you can start working on the next variation where I add n 8th note on the 2 of the bar. So in this way we have 3 different rhythms that we can use on the C blues. Note that in all three examples I am not using the 2nd half o f the bar, and I didn’t displace or leave out part of the original rhythm. Both quite powerful options to expand this even further. As you can tell I am trying to keep the voicings and melodic ideas very simple in this lesson, you can always make this more or less complicated when really comping, when you are working on the rhythms you should probably try to keep it simple. I hope you can use the examples I went over here to get some new comping rhythms and also as an approach to take any rhythm you already use and make variations on it and get more out of it. Please subscribe to my YouTube channel and feel free to connect with me viaInstagram,Twitter Google+ or Facebook to keep up to date with new lessons, concerts and releases. 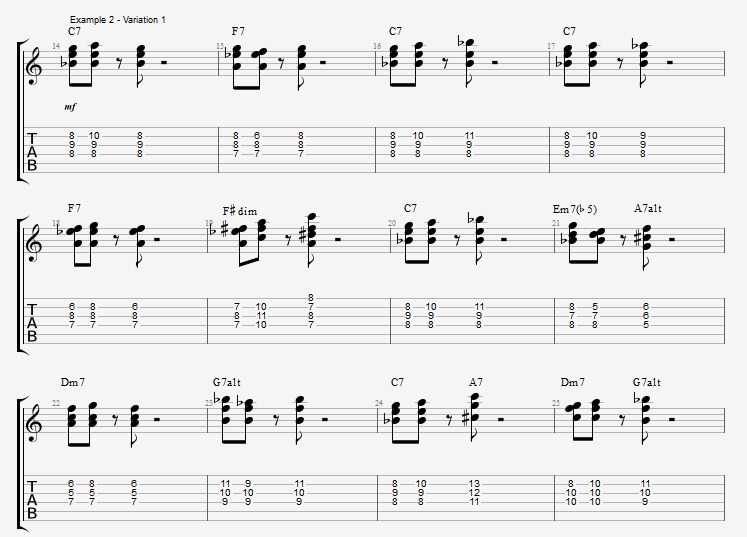 This entry was posted in Blog, Lesson and tagged accompaniment, Blues, Blues in C, C blues, charleston, comp, compin, Jazz Blues, musical, rhythm, rhythms, voicings on September 24, 2015 by jens.